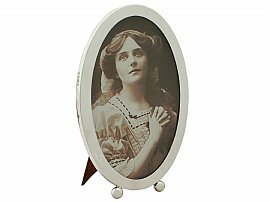 This fine antique George V sterling silver photograph frame has a plain oval form supported by two ball feet. The surface of this oval photo frame is plain and unembellished. This frame retains the original oak wood back and hinged strut, secured with two swivel catches. This impressive example of antique silverware is inset with a removable glass panel. This antique oval photo frame is a very good gauge of silver, excellent quality and in excellent presentation condition. Height of internal window 17cm/6.7"
Width of internal window 10.5cm/4.1"
Width of silver border 1.2cm/0.5"